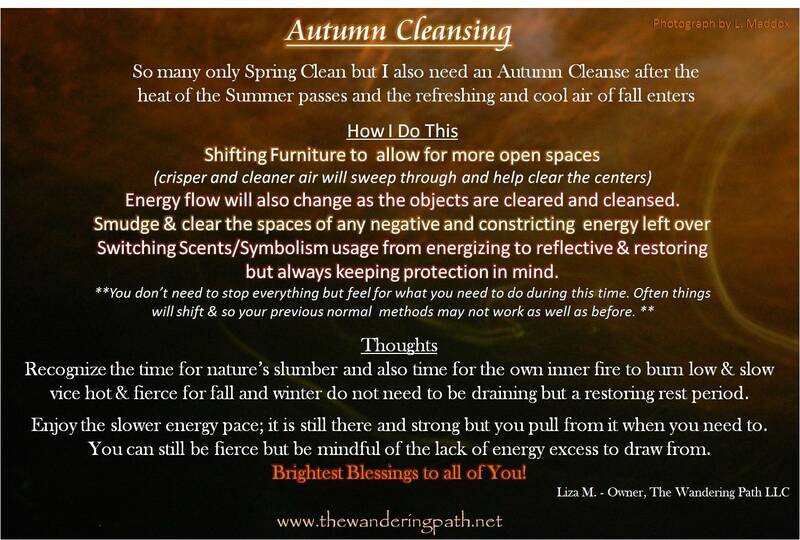 Hello moonlight risers and late to bed sleepers, it’s Liza, the Owner of The Wandering Path. 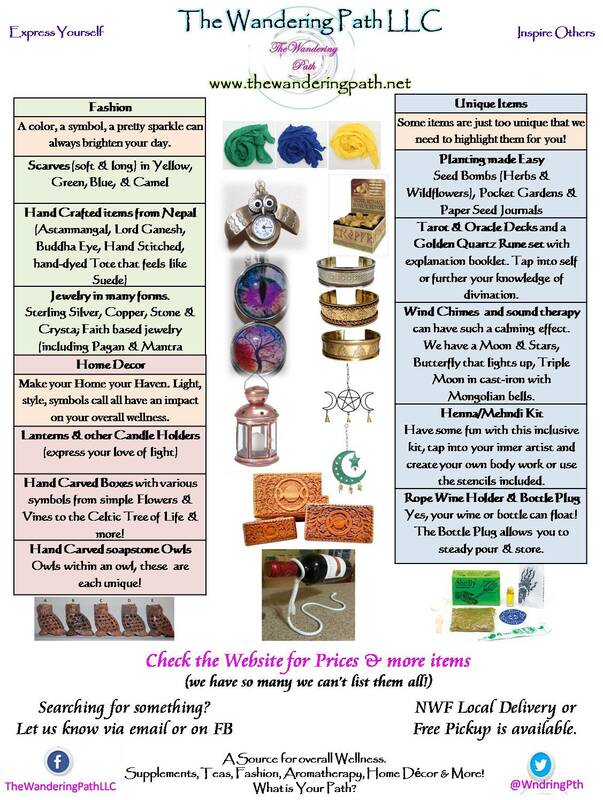 If you have been following on Facebook (or just on here) you’ve seen the new items I brought in. One of those is pendulums. Often we need a yes or no answer to something and a pendulum is a great way to get that. I brought in three crystal types (Blood Stone, Labradorite, and Ruby Zoisite) as well as spiral versions. 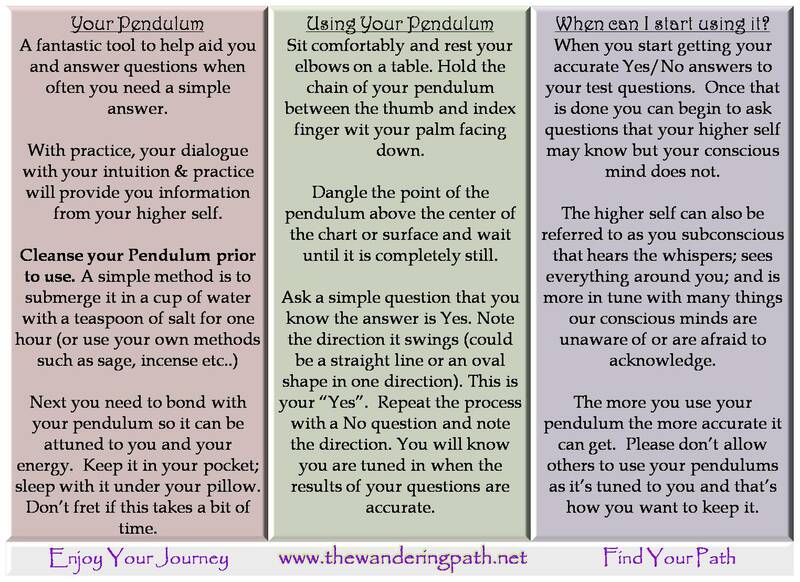 I also like to use my pendulums as a way to help guide me on some of those impromptu road trips that can be good for the spirit and soul. There are times where I feel if I don’t leave town and the normal routines or I’ll go stir crazy, so I will pull out a map, and see where the pendulum points. It always leads to interesting journeys and things I never knew were close by. 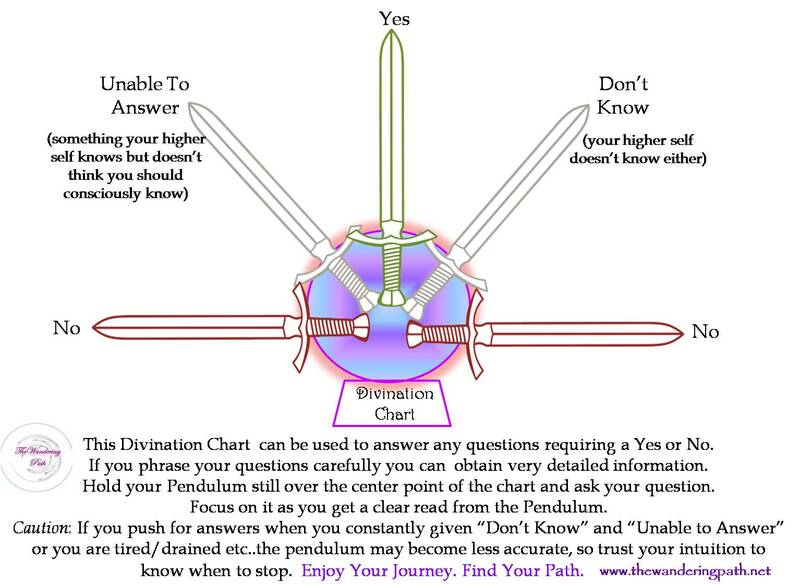 My crystal pendulums come with an instruction booklet but my spiral versions do not so I made up a modified version to post with them so people can print those off and use them. 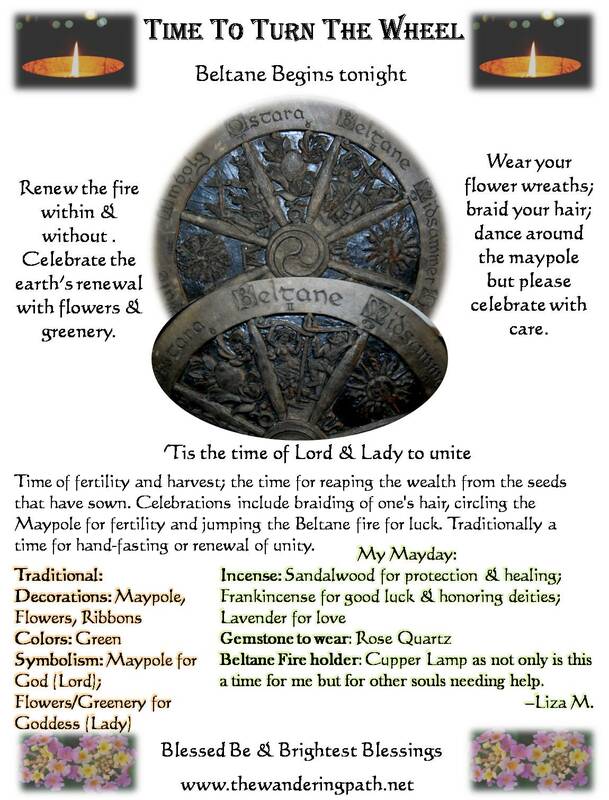 I’m posting them here for you in case you have a pendulum or have been curious about them. I brought in the Labradorite specifically for myself and already I’ve started to see a difference in my sleeping, and other things as I get in tune with it. 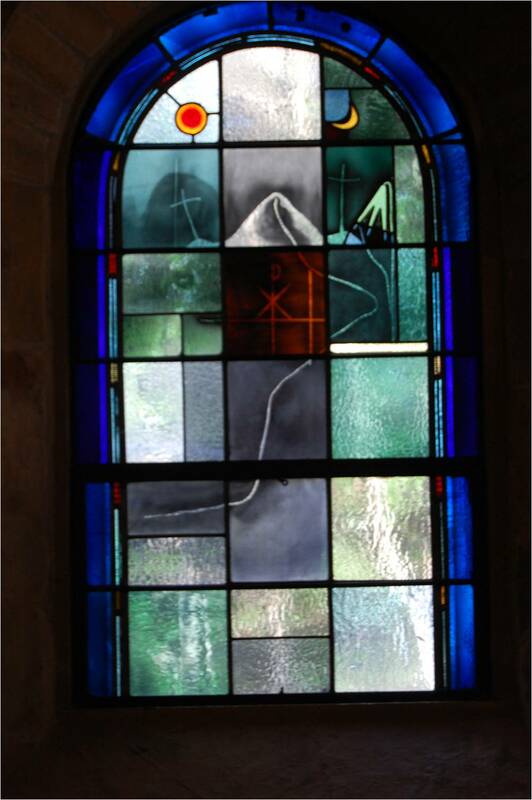 Gotta love any stone also known as the Aurora Borealis stone. BB, thanks for listening and sweet dreams. 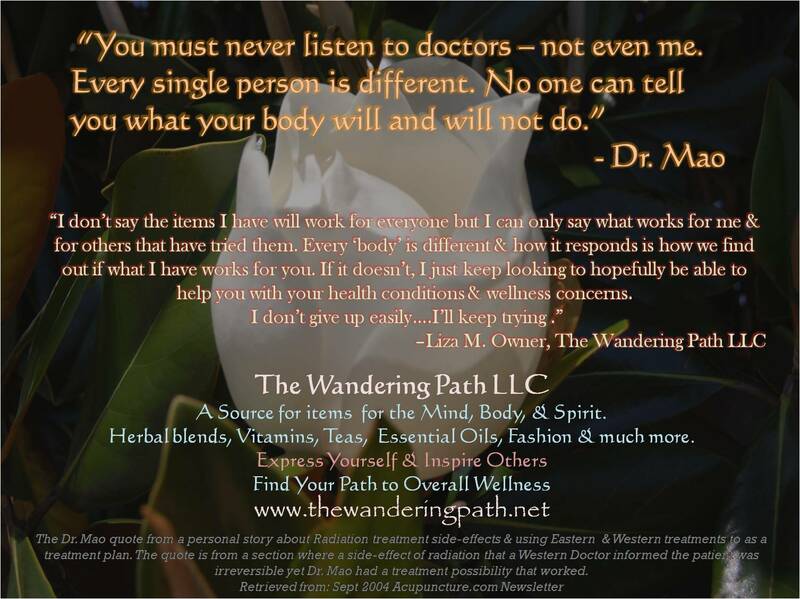 –Liza M.
Good Morning all, it’s Liza, the Owner of The Wandering Path. I have been so busy…so excuse the ramble that will follow. I have been wearing myself out with finally setting up a permanent booth as I can no longer handle the load/unload each weekend…yes my back & body forced me to make the move as well as other things…been an “oi vay” few weeks. 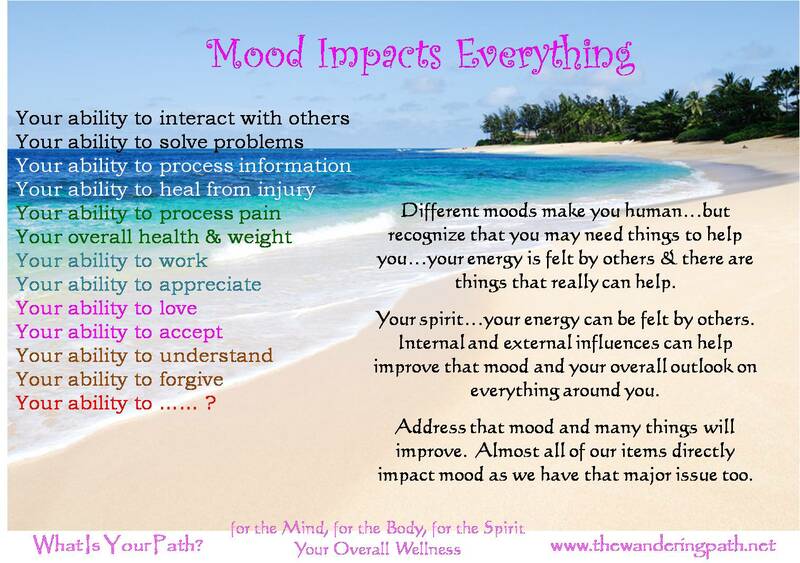 I do have many health issues and so I need to be careful about over-doing it. 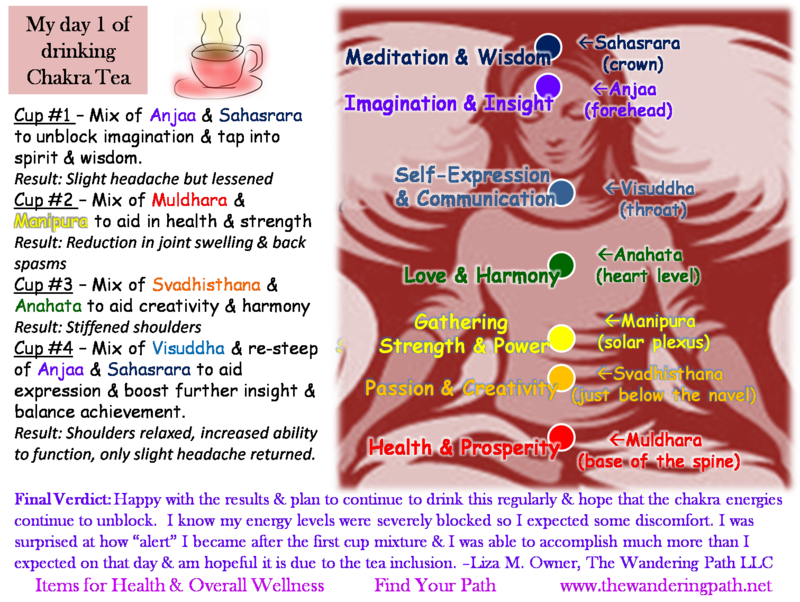 Well, I decided that perhaps I needed to give my Chakra tea a try. I had wanted to try it with my first test batch but I sold out before I could give it a try myself. I thought I’d share my Day 1 (yesterday) results with you. I was surprised by the results & how much I could accomplish yesterday after drinking it. 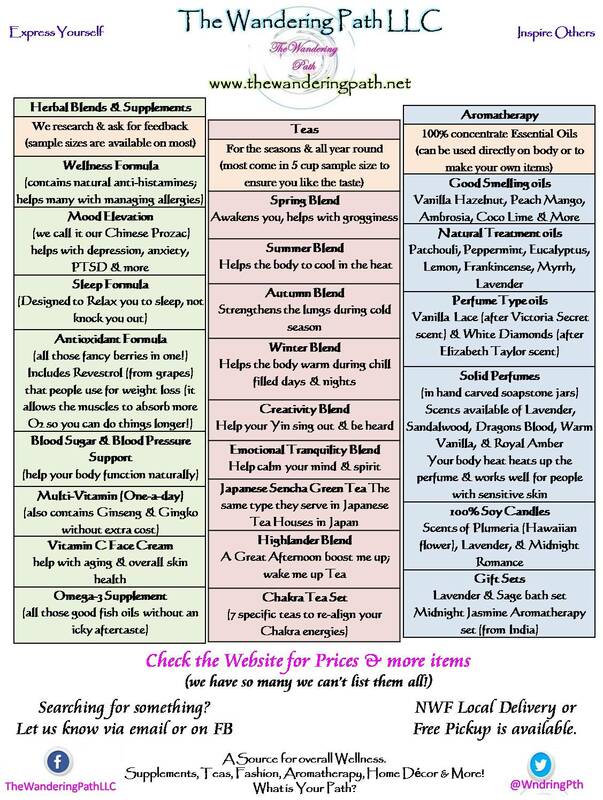 I wasn’t that shocked at getting a headache after drinking the first cup (yes, went for the 3rd eye & spirit area first as I knew it was my most blocked) but it did lessen and figure it won’t be as bad when I do it again today. Yes, I plan to drink the full box…and even have the internal debate going about getting just some of the specific blends now in on top of the assortment pack as I’m sure I’d drink certain chakra’s more than the others. BB! Wishing you all much love and luck on your paths. 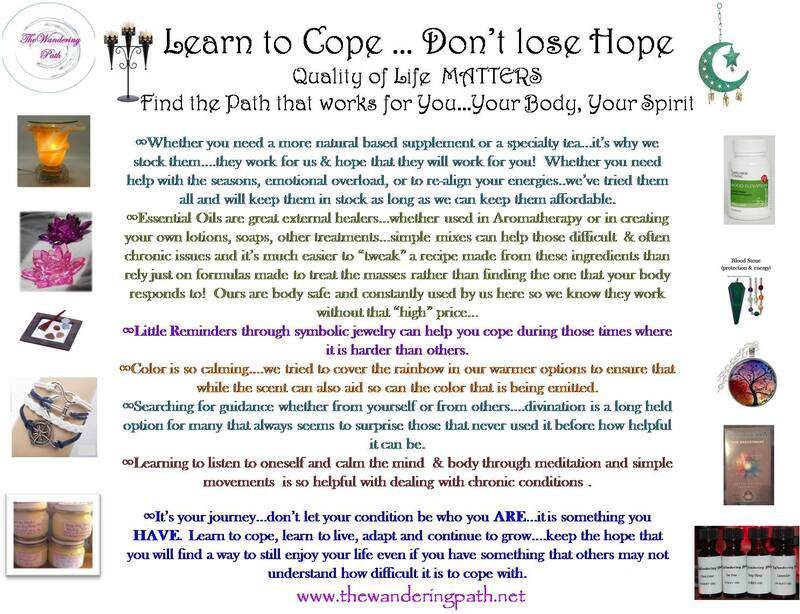 With a raised mug–Liza M.
Good Morning everyone, it’s Liza, the Owner of The Wandering Path. As the year is nearing the end, I found myself under a great deal of stress as things continue to pile up & I need to renew things as well as recharge a bit. 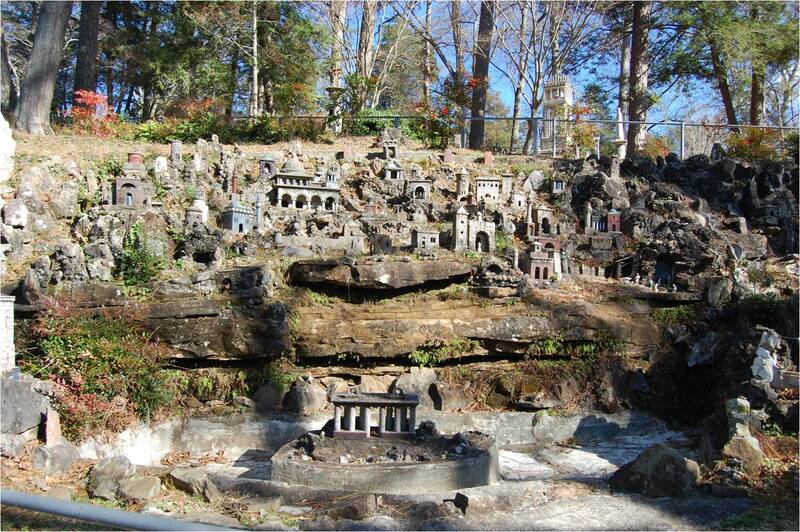 I took a day trip up to Cullman AL with a friend because I had heard of a Grotto that contained miniatures of various buildings created by a monk there that certainly had creativity in his journey. 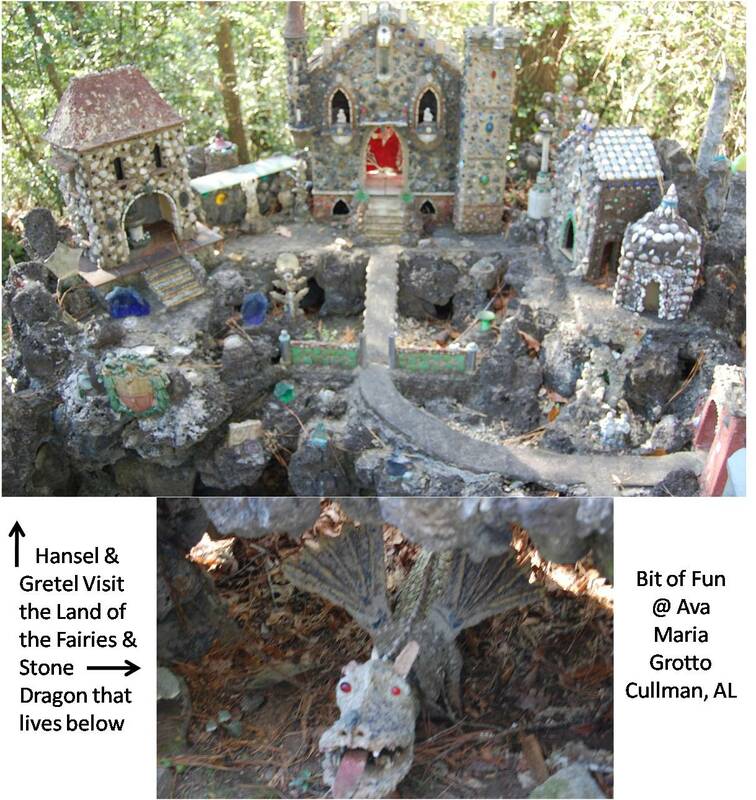 I have included some of the photos below including the little surprises that were a nice find, such as Temple of the Fairies; Hansel & Gretel visiting the Temple of the Fairies to include a stone dragon; a Lizard Condo; and crossway just for chipmunks. 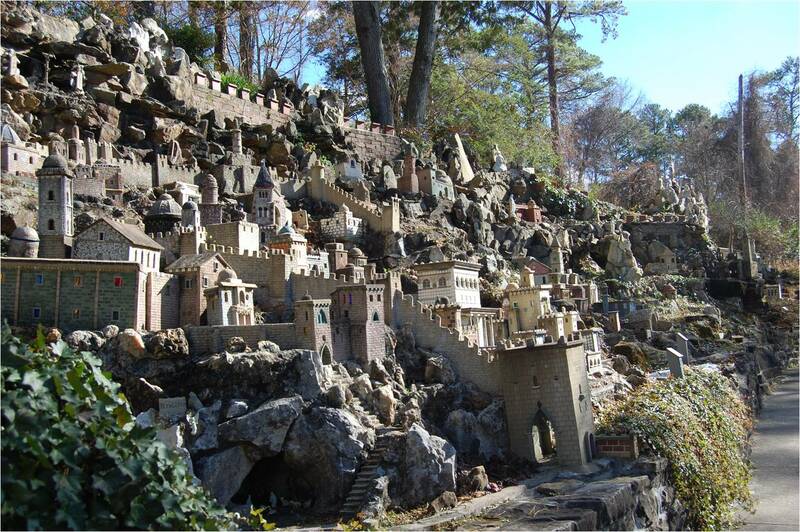 There was also the leaning tower of Pisa and hanging gardens. On our drive back, the miles seemed to go by much more quickly and before we knew it we were back home in Florida. 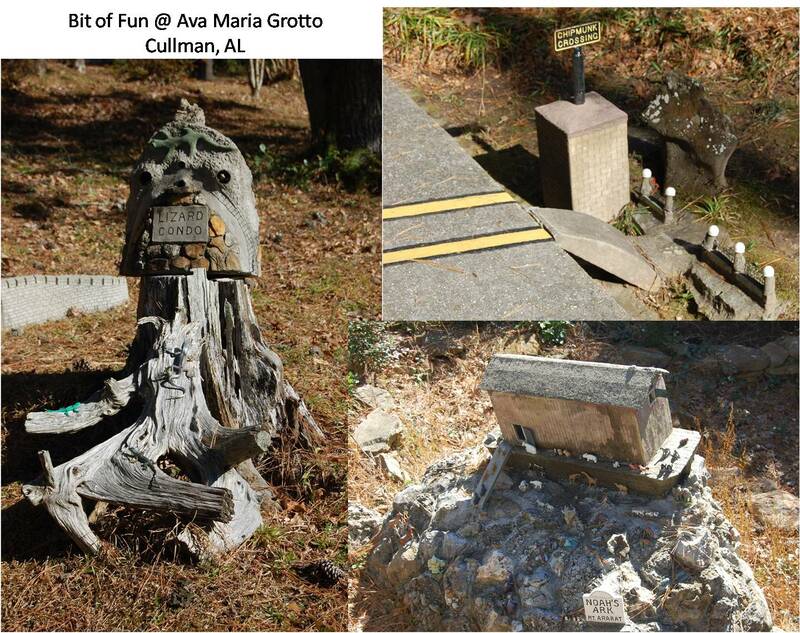 We also found a few more sites we didn’t know were there in Alabama that we want to explore such as different wineries, a large 12 story high cavern, etc…so it looks like more day trips & perhaps a few overnighters are on the books in days to come. Remember to take time and take a day away to forget stresses, ignore the cell phone and just see what is around, it certainly helped me to recharge just a bit & continue the hope for The Wandering Path to not fade into something I cannot do full time. Here is to hoping and thank you for listening. 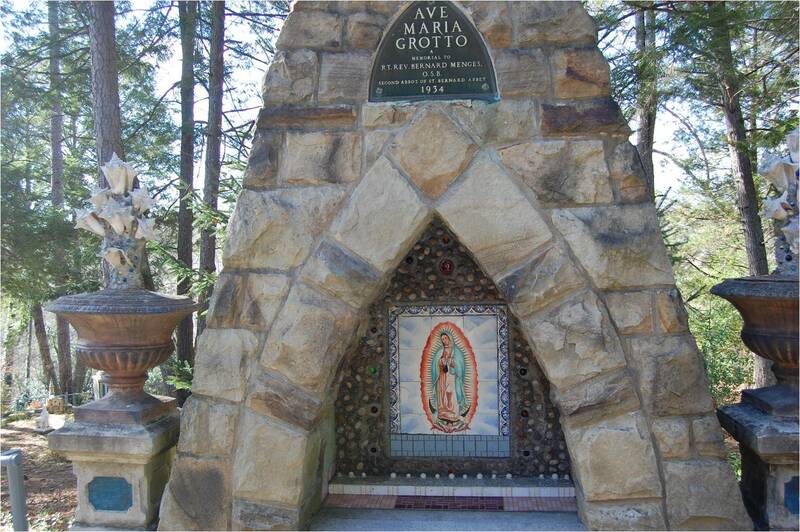 I have uploaded 64 shots of the Grotto & the stained glass windows of the chapel onto the “Owner’s Travel” section of The Wandering Path’s Pinterest site if you want to take a look. Blessed Be, Brightest Blessings, Happy Wandering. With a raised coffee mug –Liza M.